• Careful selection of children that need to be sponsored – usually one child from a family who is living in poverty. Most of these parents work as a day labourer, rickshaw puller, street hawker, house servant etc. but desperately want their child to go to school. • Complete assessment to ensure the parents are motivated and committed to send the child to school. • A sponsor family will either choose a child waiting to be sponsored, or we will match a sponsor family with a child. • We ask the sponsor child to write to their sponsor family at least two times a year to update them on their progress. • We invite the sponsor family to write to their sponsor child to encourage them and motivate them throughout the year. This often results in the child staying committed and doing well at school. 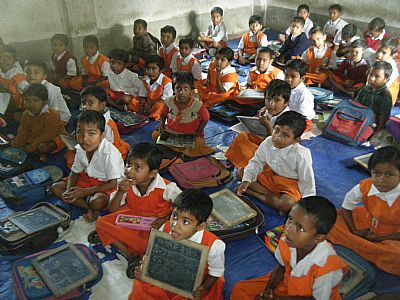 • We encourage the sponsor family to continue their support of the child until the child completes higher secondary (Class-XII, 18 years old). 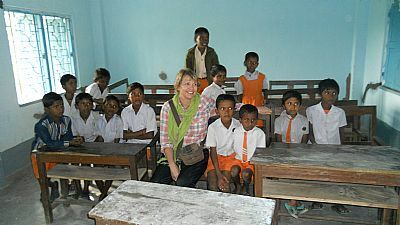 After that, they have a solid basic education, and can work to earn money for their families. Some are very bright and will continue up to University (21 years old). • If some children cannot continue their study, we inform their sponsoring parents to stop sponsoring. But if the sponsor parents want to sponsor another child, we will propose a new child that is waiting to be sponsored. • If a sponsor family can no longer sponsor the child, we endeavour to find a new sponsor family so the child does not have to stop going to school. Your sponsorship pays for your child’s school fees, study material, uniforms, shoes, socks, school bags, books, midday food, private tuition fees, everything whatever they need for their education. Although schooling is our primary focus, your support achieves far more than just educating your sponsor child. • Financial support for the child’s mother if she needs it through our Micro Savings and Micro Credit Scheme. You can choose to sponsor a child yourself, or join with a group of family or friends and sponsor a child. 2. Choose the child you would like to sponsor or allow us to match a child who is waiting for sponsorship. 3. Your sponsorship is paid directly into our account every month or as an annual amount if that is suitable for you. 4. Our UK IIMC Coordinator (email IIMCUKCoordinator@gmail.com) will communicate with you. • Your child’s file, including a photograph, family history and living conditions. • A School Progress report every year after annual examination. • The child will write on her/his birthday and the New Year. • IIMC Education Coordinators will keep you informed regularly with the reports of the school the child is attending. • You are welcome to write to the child as often as you want. • Your personal visit to Kolkata, the project and the child’s home is very welcome. We at IIMC believe that education is one of the best way you can help India and promote child human rights & social dignity. Can I donate more than the basic sponsorship rate (£10)? Yes! If you choose to add an extra amount to your monthly sponsorship you will be helping us to provide for additional educational facilities (such as playgrounds, lighting, and wells) medical services (such as outreach clinics, immunisations and malaria prevention programs), and our successful community development activities. All sponsored children benefit from initiatives or activities supported by these extra donations throughout their time in our programs.